This painting got my attention today when I saw it in the National Gallery of Art. Domenico Fetti painted “The Veil of Veronica” around 1618. Fetti was in Rome in 1606 when the Veil of Veronica, one of the oldest and most venerated relics in Christendom, was installed in the crossing of St. Peter's Basilica. According to medieval legend, the veil belonged to a woman who took pity on Christ as he toiled with his burden of the cross to Golgotha. She gave Christ her kerchief to wipe his brow, and when he returned the cloth, his image miraculously had been impressed upon it. This kerchief was believed to have been preserved as the relic called the "true image" or, in Latin, vera icon . In time, these words combined to form "Veronica," the name given by legend to the compassionate woman at Golgotha. The image is now kept in a remote monastery in Manoppello, Italy where Pope Benedict XVI visited to see it 2006. It’s interesting to note that when the first photo negatives were taken of the Shroud of Turin in 1898, the injuries to the nose on the face appearing on the shroud match up with the injuries which appear on the veil. We won’t know for sure what Christ looks like until we get to Heaven but Domenico Fetti did a masterful job capturing the anguish on the face of the man which might have been Christ on his way to the Cross. Quest for Light was the winner in the Christian Film Festival Screenplay Competition over Memorial Day Weekend. Many thanks to the Festival organizers who hosted the event and provided film makers and writers with the opportunity to share their work! 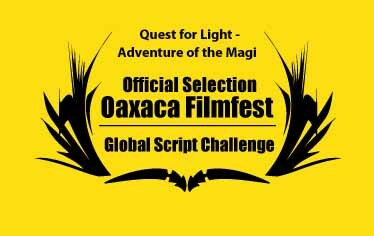 Quest for Light is a Finalist in the 2014 Magwill Film Festival and the 2014 Aura Screenwriter Awards. The myrrh-producing icon from Taylor,PA will be at St Mary's Orthodox Church in Cockeysville, MD on March 14. This will be my 4th encounter with the icon whose mysterious oil has been attributed to many miraculous healings.